Public Citizen today called on the U.S. Food and Drug Administration (FDA) to immediately add a black box warning about the increased risks of heart attacks and other cardiovascular dangers to the product labels of all testosterone-containing drugs available in the U.S. (find the petition here). A black box warning is the strongest warning that the FDA requires, and signifies that medical studies indicate that the drug carries a significant risk of serious or even life-threatening adverse effects. "You should wait at least seven years from the date of release to take any new drug unless it is one of those rare ‘breakthrough’ drugs that offers you a documented therapeutic advantage over older proven drugs. New drugs are tested in a relatively small number of people before being released, and serious adverse effects or life-threatening drug interactions may not be detected until the new drug has been taken by hundreds of thousands of people. A number of new drugs have been withdrawn within their first seven years after release. Also, warnings about serious new adverse reactions have been added to the labelling of a number of drugs, or new drug interactions have been detected, usually within the first seven years after a drug’s release." Column 3 is the date that Public Citizen warned its constituents. 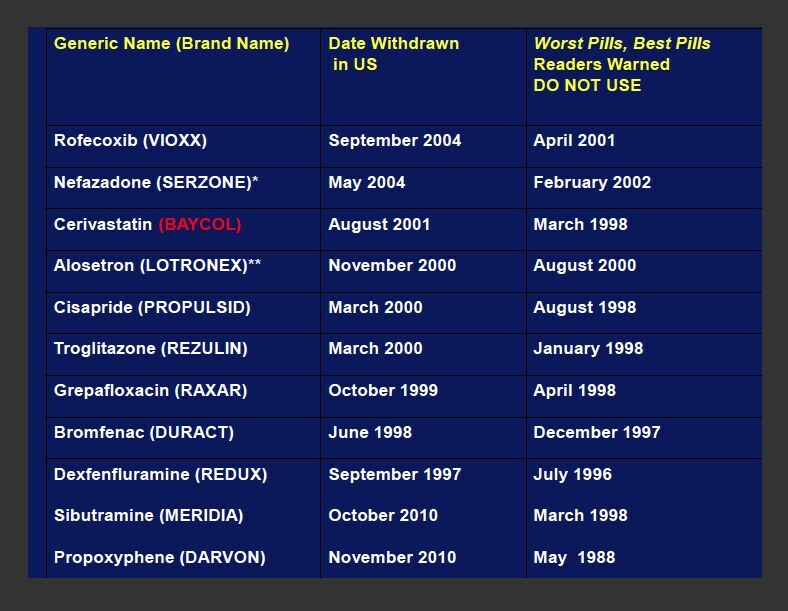 Column 2 is the date FDA removed the drug from the market. Drugs that have boxed warnings are not permitted to have reminder ads, which mention the pharmaceutical brand name but not the indication or medical condition it treats. Since the possibility of life-threatening adverse events must be included in the major statement of regular direct-to-consumer (DTC) ads, drugs with such black box warnings often -- but not always -- cease to be advertised on TV. In the case of AbbVie's Androgel, however, ceasing DTC advertising may not affect its leading market share especially because of the success of its "Drive for Five" unbranded campaign, which urges men to know their testosterone (T) levels, in addition to lipid, BP, blood sugar and PSA numbers. 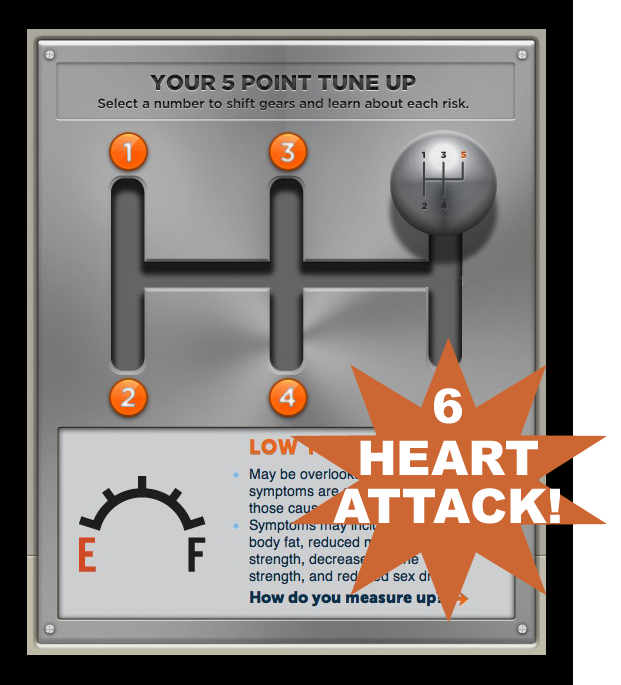 An animated "gear box" that shifts from high cholesterol (first gear) to high blood pressure (second gear) to high blood sugar (third gear) to high PSA (four gear) and, finally, to low testosterone (fifth gear) represents the goals of this award-winning campaign (read "AbbVie's "Drive for Five" Campaign: Innovative, Derivative, and Conflictive?"). My "black gear box" rendering at the top of this post adds a 6th gear: Heart Attack! In this 1-minute audio snippet, Sydney Wolfe, MD, formerly head of Public Citizen, explains why you should wait at least seven years from the date of release to take any new drug unless it is one of those rare ‘breakthrough’ drugs that offers you a documented therapeutic advantage over older proven drugs.